Sonca-17 is a tropical storm that affected the north-central coast of Vietnam. This storm originated on 17 July 2017 in the South China Sea (northwest Pacific) at a speed of about 28 km/h. On 25 July 2017, tropical storm Sonca-17 made landfall on the Quang Tri Province, Vietnam and it is expected to move a few hours later towards the Khammouan Province, Lao PDR with a maximum sustainable wind speed of 55 km/h. The tropical storm is soon expected to dissipate on land. 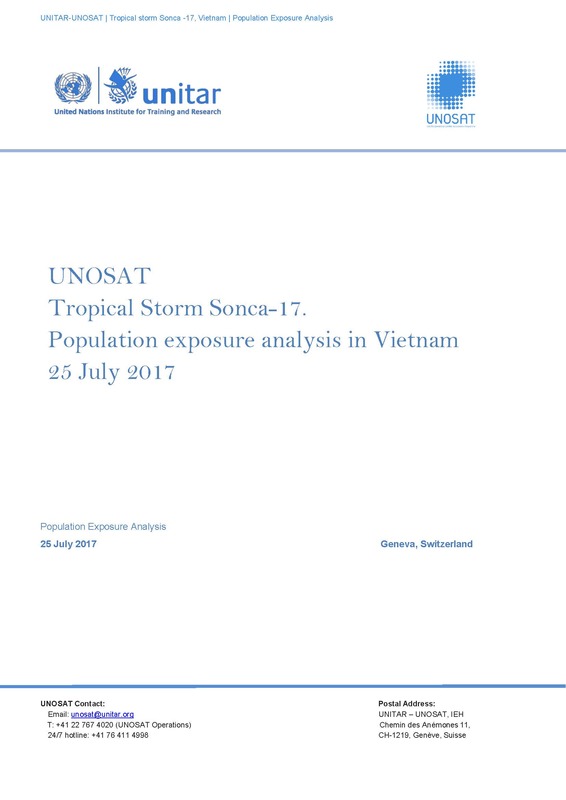 Based on data of the observed and predicted tropical cyclone path, wind speeds zones from JRC (Warning 18 issued on 25 July 2017 at 06:00 UTC), and population data from WorldPop, UNITAR-UNOSAT conducted a population exposure analysis for Vietnam: 3,400,339 people are living within 60km/h wind zones.